Our Ambassador Julia Allan is a Melbourne based Physiotherapist working in a few different sports physio clinics and with elite sporting teams as well as playing netball in the State League competition herself. She has worked with Melbourne City FC in soccer and has travelled to China with Andrew Gaze’s Australian All Star side. She is currently working in netball with the Under 19 Victorian side and the Australian Netball League side - Victorian Fury. 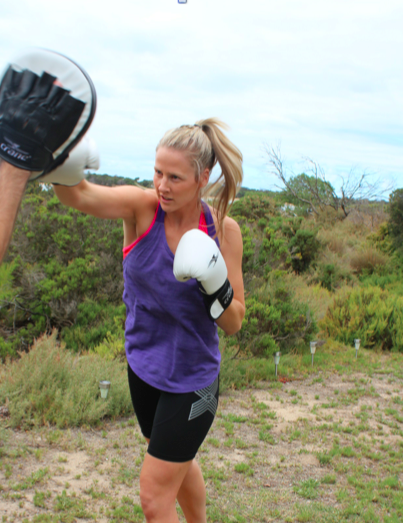 Read below for Julia's tips on boxing and how it can prevent injuries. How Boxing can be a great fitness alternative? As a physio I’m often asked when athletes and fitness fanatics are injured “what else can I do?” Swimming is often the obvious choice of activity depending on the injury as in the depths of the water most of your body weight load is taken off your joints. There are many options in the water often including actual swimming, kicking with a kickboard or deep water running can also be a great alternative for runners that can still be a high intensity workout. However, in my experience many people really don’t like swimming as they are either not a natural swimmer, don’t like the germs or simply find it too time consuming by the time you shower afterwards, etc. Boxing is often something that people forget about and I’m not sure why, when all the Victoria Secret models do it don’t they! It is a great alternative as you can really offload the legs and get a cardio or high intensity workout by using predominantly the arms and abs. It’s a great form of fitness when you are not injured and ideal when you have any lower limb injuries that you need to limit impact exercise on such as stress fractures, foot and ankle injuries, shin splints etc. Often for sidelined athletes the mental effect can almost be worse and finding ways that they can keep fit can make a massive difference physically and mentally! It’s used quite a lot with injured AFL athletes to help keep them motivated, fit and to help with team inclusion. You do require a set of pads and generally a partner however, gloves and a punching bags are often in most gyms. If you’re involved in team sport it wouldn’t take much to get one set of boxing gloves and pads that your injured athletes sitting at training could use. How can boxing help with injury prevention? Overload injuries seem to be one of the most prevalent in many sports involving running such as netball, basketball, football, and running itself. Often coaches and individuals are uneducated in how much running and impact work is appropriate and how many rest days the joints require. I see so many patients with overload injuries such as Achilles tendon problems, ankle joint pain, foot stress fractures, shin splints, knee overuse injuries etc. So many times if the individual or coach of the sport had of mixed up the training just slightly they may never have happened! It is literally as simple as swapping one run per week or half an on court session in basketball to a boxing circuit session. The players certainly enjoy the mix up in training and the joints, muscles and tendons are less susceptible to repetitive loading injuries. Yes, it is true when training for a specific sport such as a marathon or netball the training is best when it is specific to the sport as the muscles will adapt in a closer way to the way they need to work when competing. However, no one can compete well when they are injured or riddled with overuse niggles.